The POS API allows retailers to automatically redeem coupons through their POS. Through the POS integration, retailer can redeem coupon codes from Liquid Barcodes. The process is a two step process. Step 1 is Reserve, Step 2 is Validate or Cancel. Barcode Graphical, scannable / machine-readable, representation of code (including prefix). Cancellation The cancellation of a reservation whose conditions were not met. Code A code given to the customer representing an offer given to the same customer. Coupon A coupon (image or text) containing a code (see above). LIQUID A short hand reference to Liquid Barcodes and this API. LiquidReference An unique reference used by LIQUID to keep track of the transaction. Normal reservation The normal mode for reservations. One or more codes are specified, which are then reserved. One-Scan A special reservation mode where all codes owned by a user are reserved. Can be initiated either by specifying the user or by specifying a code owned by the user. Prefix The code (see above) may need a prefix, for example to route the reservation to LIQUID Barcodes’ systems. Reservation Singular, unique offer that corresponds to the particular use of a code (see above). Validation The confirmation of a reservation whose conditions were met. Prefix + UniqueCode. In total 12 digits. Prefix + UniqueCode + Control digit. This is only used when the barcode has to be of type EAN-13, where the last digit is a control digit. Prefix + ’01’ + CampaignCode + ’21’ + UniqueCode. The basic concept is that when a coupon/code is scanned/entered manually the system returns the corresponding reservation with conditions. This reservation is unique and subsequent uses of the same code/coupon will result in a new reservation with conditions that may or may not be identical to the first. Once the sale is completed, the reservation is either validated (the conditions have been met) or the reservation is cancelled/freed (the reservation’s conditions have NOT been met). We use the term coupon or code as the representation of the offer to the consumer, and reservation as the singular, unique offer that corresponds to a particular use of the coupon. A coupon/code may in other words trigger multiple reservations with separate conditions. The process of validation is done in two stages. Once the coupon is scanned or the coupon code is manually entered at the POS, a reservation request is sent from the POS to LIQUID (RESERVE function). Upon receipt of the RESERVE message LIQUID will respond with an acknowledgement message and this message may be positive (the coupon exists and can be used) or negative (the coupon doesn’t exist, is not valid, or has already been used). If the RESERVE response is negative an appropriate message to the cashier/consumer should be displayed, according to the error types described in this document. A positive RESERVE response, called a reservation, will also contain conditions that need to be fulfilled before the rebate can be given to the consumer. Typical conditions are what products need to be on the receipt, the size and type of the rebate, a minimum total sale etc. A successful reservation will mark the coupon as reserved in LIQUIDs system, and this particular use of the coupon is locked until the reservation is either cancelled or validated. If the coupon can be used more than once, each use requires a separate reservation request, as the conditions for the rebate may change for each use of the coupon (an example would be a coupon that gives 5 % rebate for the first use, 10 % for the second, 15 % for the third, etc…). Once the sum of unconfirmed reservations and previous validations of a coupon/code equals the maximum number of validations it will no longer be possible to reserve the same code, unless one or more of the reservations are cancelled. When the sale has been concluded, the POS has to determine whether the conditions for the reservation has been met (i.e. the required products are present on the receipt). 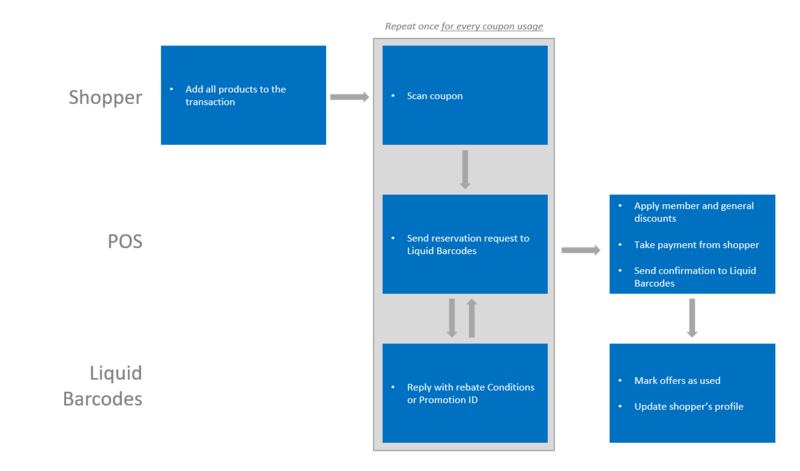 When receiving payment from the consumer the POS must send a final confirmation to LIQUID containing whether the consumer received the rebate. This is done through the validation request (VALIDATE function), as a confirmation or a cancellation. LIQUID will respond by sending VALIDATE response to confirm that it has received the validation. If no VALIDATE response is received the POS should retry at least 3 times. If the rebate/coupon is removed from the receipt or the conditions have not been met, the POS should send a VALIDATE message and indicate that this reservation was cancelled. This will free the code for later use. As a fail-safe in case the POS is unable to validate a reservation (by validating or cancelling), to prevent reservations from lasting indefinitely and to prevent that consumer is unable to use the coupon at a later stage, all reservations are automatically cleaned up 15 minutes after the reservation is made. If this occurs it is no longer possible to complete the validation (by validating or cancelling). In the case where the receipt is intentionally parked/paused one risks that the clean-up happens while it’s parked. There are multiple alternative ways to handle this. The preferred option is the first one, however, depending on POS architecture and other factors, this may not always be ideal and the alternative implementation may be a better solution. Cancel all reservations when unparking the receipt and immediately reserve them again. If the coupon has been used on another order in the mean time the reservation will fail, if not the reservation will go through. Trying to make it before time-out. When the receipt is unparked the reservations can be in the following states and the POS will have to consider what to do with them. Before the reservations time-out. The rebate is given and the validations will still go through, however, the time before validations must happen is reduced by the time the receipt was parked. After the reservations time-out. When finalizing the purchase the validations will fail, and this should be handled by either replaying reservations. Alternatively, allowing the user scan his/her coupons again before finalizing the sale. Cancel all reservations when parking the receipt. The user must be notified that the coupons will have to be scanned again. 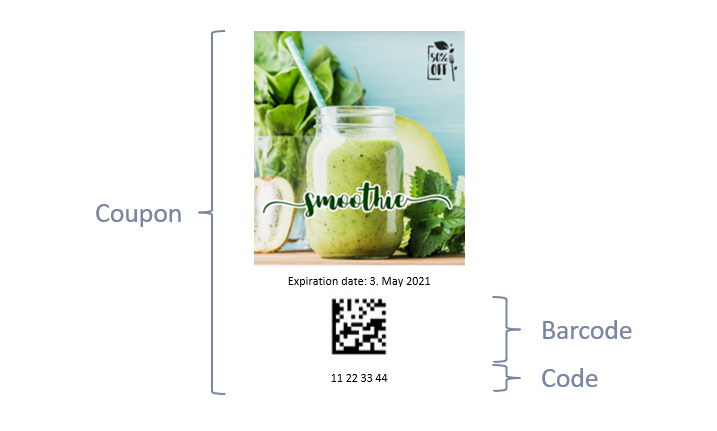 LIQUID Barcodes will add additional receipts to the transaction as a field on the VALIDATE response.This implies that there has been at least one coupon present during the transaction (note that the coupon may not give a discount in itself, but represent a membership card). The rules for which offer(s) to trigger for the additional coupons are then set up in LIQUID Barcodes system entirely, and conditions can span several purchases. 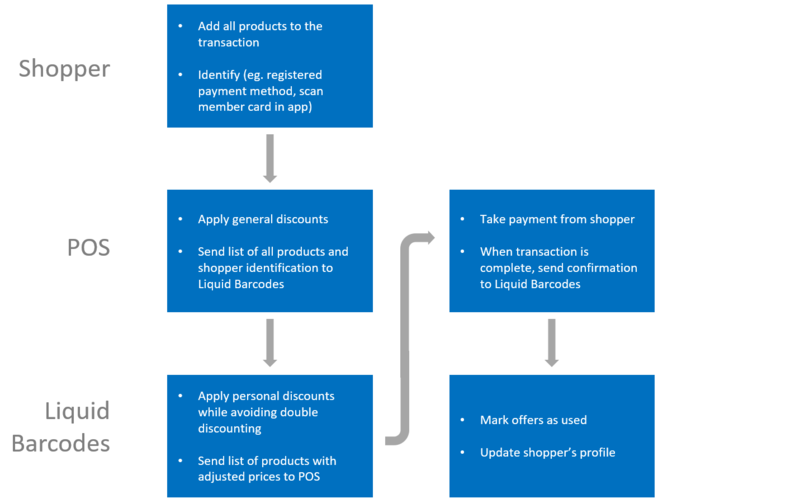 The POS will during the finishing phase of the transaction query LIQUID Barcodes with the complete receipt for the transaction and an additional receipt may be returned based on either the total value in the purchase or which individual products were present. Note that this may issue coupon to any customer that has not already used a LIQUID Barcodes coupon in the transaction. To activate this functionality the POS needs to call the Receipt function call that is detailed below. If the user has used some LIQUID Barcodes coupon on the transaction, this function should not be called. It should be noted that based on the configuration of the campaigns, and what information is available for the individual consumer, a receipt coupon may be distributed to the consumer through a different distribution channel. E.g. If the mobile number of the consumer is known to LIQUID Barcodes the system will distribute the coupon on SMS directly to the consumer. If the mobile number is not known the same coupon would be returned as an extra receipt to be printed by the receipt printer. The configuration of distribution channels is a property of the LIQUID Barcodes system. The format is a minimalist XML format. There is no XML-header used in the format and there is no XSD available. Receipt texts are only used in the context of the Validation API and as such the enclosing HTTP response headers define the character set for this content. This is the container tag for all additional receipts. There will be only one of this tag. This is the container tag for one additional receipt. If this receipt was created from a validation, this value references the reservation ID for the reservation+validation that triggered it. A barcode to add to the receipt. The value of the barcode is given as content for the tag. Format of the barcode. Required attribute. An image to add to the receipt. The binary data of the image is given as content for the tag. Any whitespace characters should be removed from the content before decoding, as the content may have been chunked. The image format used in the enclosed binary data. Required attribute. Currently the only supported format is image/png. The encoding used on the enclosed binary data. Required attribute. Currently the only supported encoding is base64. A text paragraph, optionally formatted (see level four tags), to add to the receipt. All text content should be trimmed for any leading/trailing whitespaces. Multiple consequtive whitespaces should be treated as one whitespace. Linebreaks should be treated as spaces, as linebreaks are explicitly defines by BR tags. Text color in hexadecimal red (rr), green (gg) and blue (bb) components. Optional attribute. The content of this tag should be formatted as bold text. The content of this tag should be formatted as italic text. The content of this tag should be formatted slightly smaller than other text. The content of this tag should be formatted slightly bigger than other text. Line break. Whitespaces before and after the linebreak should be trimmed. Text color in hexadecimal red (rr), green (gg) and blue (bb) components. Required attribute. 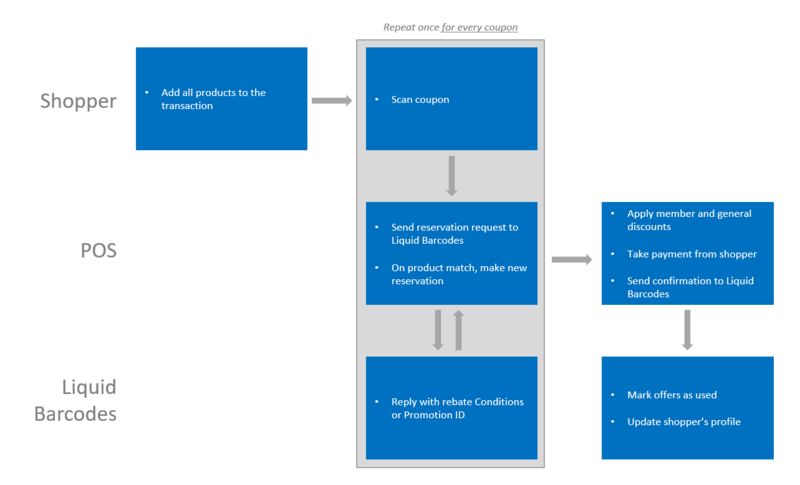 TPoSProcessing is the time the PoS requires to process the incoming conditions from LB and align with the current transaction at the PoS. Given that there is very little to process at this stage, the PoSProcessing step should be fairly insignificant. The API is available through a secure web service exposed at https://validator.api.barcodes.no/v3 . The client can expect a signed, valid SSL certificate for this endpoint. Some standard HTTP response statuses are used to indicate success or failure. See Responses section below. Authentication, timestamp and signatures are required for all services and are submitted as headers. See Requests section below. All dates and times must be formatted as a ISO-8601 timestamp, for example 2014-03-06T13:11:04+03:00. The unique coupon codes should not be added to the printed receipts, as it would allow a third party that gets access to the receipt to use another person’s coupons. Authentication via the HTTP header Authorization. We use the BASIC authentication mechanism. Username and password are provided by LIQUID. A timestamp via the HTTP header X-Liquid-Timestamp. It should be set to the current time when the client sends a request and must be formatted as a ISO-8601 timestamp, for example 2014-03-06T13:11:04+03:00. The services will reject any request where the time deviates more than 10 minutes from our current time. A signature via the HTTP header X-Liquid-Signature. See the section below on Calculation of the signature. The services will reject any request where the signature cannot be verified. The HTTP response code will identify the outcome of any request. 200 (success): The request was successfull. 400 (bad request): A value in the request was considered wrong and caused the processing to stop. One typical value is the signature. 401 (unauthorized): There was a authentication problem (username and password is provided by LIQUID, contact support). 500 (internal server error): There was an unexpected problem (contact support). Note that these codes are response-level status codes (as in one response, as a whole). In other words a 200 / success response may well contain rejected reservations / validations / cancellations. These can be identified by inspecting the nested RejectCode and RejectMessage fields. Furthermore a non-200 / unsuccessfull response code means the whole request has been rejected, with the exception of 500-errors which means something unexpected has occurred and the state is uncertain. Unless another format is specified in the Accept header of the request, the format of the response body is JSON. The format of the response body can always be found in the Content-Typeheader. In addition to authentication the services use a signature to further validate the customer and the authenticity of the request. The content of the request (which fields and their order is specified in each services specification below). The secret salt provided to you by LIQUID. The correct signature is the hexadecimal upper-cased SHA1 hash value from this content. The customer salt is 123SALT123. We want to reserve the UniqueCode 78907890. Authorization header for basic HTTP auth. X-Liquid-Timestamp header format in ISO-8601 format. X-Liquid-Signature see detailed calculation explained below. modelsource = "MYSTORE001" + "MYPOS002" + "MYOPER003" + "MYTRANS004" + "MYINTPOS005" + "12341234" + "9876543210123" + "MYUSER006" + "0"
source = "2015-02-10T22:53:44Z" + modelsource + "123SALT123"
This document describes the process flow and protocol for validating coupons issued by LIQUID Barcodes on behalf of the stores. In order to utilize this interface there must be a commercial agreement with LIQUID Barcodes in place, and a technical verification that the implementation has been implemented correctly. In all circumstances the intellectual property rights (IPR) of the interface resides with LIQUID Barcodes. LIQUID Barcodes reserves the right to change this interface at any moment. Any implementation that utilizes this interface is the sole responsibility of the implementor, and under no circumstances should the issuing of this document be construed to signify that LIQUID Barcodes will participate with the implementation, testing, verification of the implementation, unless otherwise agreed. Liquid Barcodes POS Integration ensures quick and efficient customer experience in store. The member discount calculation is performed by Liquid Barcodes. This simplifies the POS integration. Customer identifies once in store. When all products have been added to the transaction, POS sends customer identification and list of products to Liquid Barcodes. Liquid Barcodes applies personal discounts. POS receives list of products and updated prices. When customer has paid and transaction has been closed, POS sends validation request to Liquid Barcodes. If customer wants to add products or on unsuccessful payment, POS sends cancel request to Liquid Barcodes. The Standard POS integration uses the Applicator services – Reserve and Validate. API to be completed 2019. Liquid Barcodes offers multiple alternative POS integration methods. Customer only registers once per transaction. The API allows for the usage of unique User IDs instead of scanning individual coupons. The typical use case is that the consumer is identified by his membership number or registered payment method (eg. credit card) and will receive all the offers he is entitled to without having to scan multiple coupons. 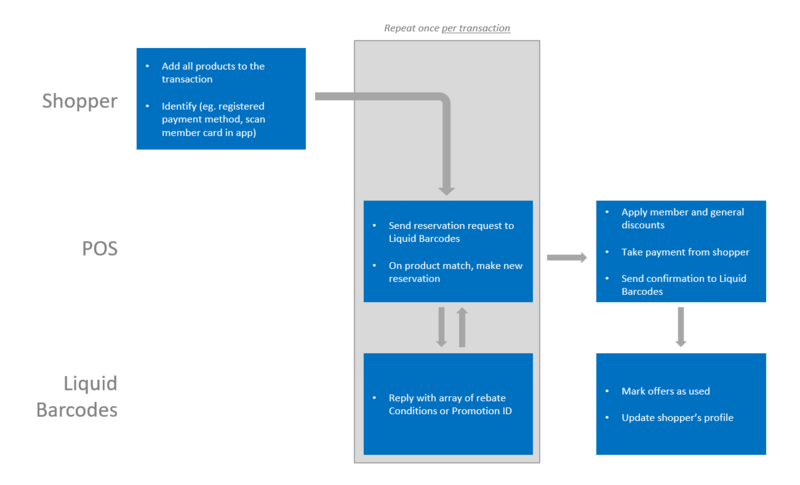 Note that the process of identifying the user ID from credit cards and translating from the credit card details to the unique user reference is not handled by LIQUID. Once the user is identified, the POS can send a RESERVE request to LIQUID with the unique User ID in place of a coupon code. A successful reservation will return the collected results of a reservation for all of the users available coupons. That is, it will return the first available reservation for each coupon that the user is eligible for. Once the conditions for a reservation is met (and the corresponding coupon can be used several times) the POS must automatically fetch the next reservation for that coupon (see multi-use above). Once the sale is completed and the products are paid for, all the reservations can be validated/cancelled in a single VALIDATE request. This is a hybrid between the “One coupon at a time” and “Identify once” POS integration methods. When scanning multiuse coupons, such as loyalty cards, POS automatically makes a new reservation when the offer conditions matches the product(s) on the receipt. One attribute of a coupon is that it may be used more than once, e.g. three times, 5 times or unlimited numbers of times. The conditions for the rebate may differ for each subsequent reservation. To prevent that the consumer has to scan the coupon multiple times to use it multiple times on the same receipt, the POS should automatically reserve the coupon/code given that certain conditions are met. When the conditions for a reservation is met, the coupon has more remaining validations and the coupon can be used more than once per sale, the POS should automatically reserve the coupon again and receive a new set of conditions. An example would be a coupon that can be used 3 times, and give a rebate when buying a particular product (A), The rebate given is 5 % discount first usage, 10 % discount second usage, and 15 % discount on the third and final usage. A consumer then scans the coupon at the POS (this initiates the first reservation), and adds product B, C and D on the receipt (which will not meet the conditions for the reservation). The consumer then adds product A, and the conditions for the first reservation is met. As the coupon can be used multiple times on the same sale and have remaining uses, the POS automatically reserves the coupon a second time and receives the second set of conditions. The consumer adds another product A, and the conditions for the second use has also been met, which triggers the third reservation. When the consumer adds the third product A the conditions for the third reservation is met, but as there are no further uses left the POS doesn’t reserve a fourth time. To simplify the process, all outstanding reservations can be validated/cancelled in a single VALIDATE request. Shopper must register each coupon she wants to use one time per usage. Say for example she has bought two loyalty card products. She must scan her loyalty card two times to get two stamps on the loyalty card. On each scan, Liquid Barcodes makes a reservation on the coupon code and replies with correct rebate conditions. When transaction is complete, POS must validate the reservations that have been used. If shopper scans too many times, POS must automatically cancel unused reservations. This is a basic POS integration. It is easier to implement in the POS than the other integrations. The disadvantage is that it takes more time in store. On reservation, Liquid Barcodes replies with Promotion IDs for the shopper’s personal offers. The Promotion IDs are discount triggers that have been created in the POS before campaign start. POS only applies Promomtion ID from each reservation once. To obtain additional Promotion IDs, new reservation must be made. The advantage of using Promotion IDs is that discounts can be determined using POS existing rebate engine. The disadvantage is that the marketeer must maintain two systems – the coupon campaigns and the Promotion IDs. The Promomtion IDs will be sent to POS using the ExternalParamater field in the Reservation response. On reservation, Liquid Barcodes replies with rebate conditions for the shopper’s personal offers. The rebate conditions define in detail the requirements for this particular rebate to apply and the value of the rebate. POS only applies Conditions from each reservation once. To obtain additional Conditions, new reservation must be made. The advantage of using Conditions is that the marketeer only needs to maintain one system. The disadvantage is that discounts must be calculated using a custom rebate engine in the POS. The Conditions will be sent to POS using the Conditions field in the Reservation response. StoreRef Store reference The store reference is the unique identifier for the store of that retailer. Will be allocated by LIQUID, and will only change if the cash register is physically moved to another location. OperatorRef Cashier reference Optional. An anonymous identifier for the cashier using the cash register. If used this ID is at the discretion of the store. TransRef Transaction reference Unique identifier for the particular transaction on the cash register. Has the same value across the whole receipt, and is unique across all stores. The TransRef uniquely identifies one and only one receipt in all the transactions of the retailer. LegalEntity Legal entity Optional. An identifier that identifies the legal entity that owns the store. This will change upon a change of owner of the store. If not blank the value in this field will appear in the validation report for this validation. InternalPosRef Internal reference ID Optional. Parameter that maps the transaction to the internal cash register reference ID. If more than one parameter is used, the field takes the format “parameter1:parameter2:parameter3” May optionally be left blank. RetryCounter Retry counter Initially this value is always 0. In case the POS needs to retry the request the value should be increased by 1 per attempt. It is used to handle network issues or other issues where the POS does not know whether a request was successfully submitted. The unique reference to the user. In this mode Codes must be empty or the reserve will proceed as a normal reservation. The special trigger value [ONESCAN-RESOLVED-FROM-CODE] . In this mode Codes must contain exactly 1 entry with UniqueCode set. A one-scan will be performed for the owner of this code. CampaignCode Campaign code Optional. Campaign code in the barcode of the coupon. If UniqueCode is manually entered this field is not used. UniqueCode Unique coupon code If the coupon code is manually entered this field contains the printed digits below the barcode. BalanceOffset Optional. Requested giftcard balance change. Negative amount means balance deduction. Positive amount means balance increase / top-up. For giftcard reservations that do not specify a value here 0 is used. Position Optional. An attempt to acquire geographical location. Should be set whenever an attempt to acquire location was made. In this object you must set either Position or ErrorCode+Error. Position Optional. Must be set when the attempt to acquire geographical location succeeded. The position will be used to attempt identification of which store performed the reservation. Position is given as decimal degrees (DD). Conversion from sexagesimal (DMS): With degrees, add minutes as /60 fractions, add seconds as /3600 fractions. Longitude Longitude / meridian. Range from -180.0 (180 degrees west) to 180.0 degrees (180 degrees east). Latitude Latitude / parallel. Range from -90.0 (south pole) to 90.0 degrees (north pole). Accuracy Optional. The accuracy for the position in meters. Altitude Optional. Altitude in meters, relative to sea level. AltitudeAccuracy Optional. The accuracy for the altitude in meters. Speed Optional. Current velocity of the device in meters per second. Heading Optional. Current heading in degrees of clockwise deviation from heading true north (which means that 0, 90, 180, 270 degrees is north, east, south and west, respectively). ErrorCode Optional. Must be set when the attempt to acquire geographical location failed. Error classification. One of: PermissionDenied, Unavailable, Timeout, NotSupported, Unknown. Error Optional. Must be set when the attempt to acquire geographical location failed. Error message / details. May be a blank string if there are no further details that ErrorCode. LiquidLogRef Log reference A reference to LIQUIDs internal logs. ReservationId Reservation reference A reference to this reservation. It will be formatted either as a number or a GUID (i.e. it should always be treated as a string). This value is the relation between reservation and validation / cancellation (see the Validate service). UniqueCode Unique coupon code The reserved unique coupon code. CampaignCode Campaign code Only present if CampaignCode was used in Reserve request. Timestamp Reservation timestamp The date and time when the reservation was completed. Id Campaign ID The ID of the campaign associated with the unique code. Description Campaign description Optional: Short description of the campaign to be displayed in the POS and/or printed on the recipt. Type Campaign Type The campaign type. Currently the only values in use are “Rebate”, “Giftcard”. Start Campaign Start Timestamp for campaign start. This is the earliest possible time to reserve coupons for this campaign. The timestamp should be used only for informational purposes, not to decline a reservation. End Campaign End Timestamp for campaign end. This is the latest possible time to reserve coupons for this campaign. The timestamp should be used only for informational purposes, not to decline a reservation. CouponExpires Coupon expiry timestamp Timestamp for last possible reservation of this coupon. This value can not be later than Campaign.End. Rebate Optional but either Rebate, Tender or both must be set. If this field is FixedPrice then some products to rebate will be specified in the ProductGroups. Value Rebate value The value of the rebate, see related field Rebate.Type. This field may be zero. Also the value of this field may be negative, in this case the consumer is not getting a rebate, but have to pay for the use of the coupon. Negative rebate is primarily used for prepaid/top-up cards, where the first usage of coupon allows the user to buy x rebated products for later. MinimumValue Minimum rebate value Optional. Minimum value of the total rebate in the case where the rebate value is undetermined. Tender Optional but either Rebate, Tender or both must be set. Percentage for percentage value (not yet supported). Value Tender value The value of the tender, see related field Tender.Type. This field may be zero. Also the value of this field may be negative, in this case the consumer is not getting a rebate, but have to pay for the use of the coupon. Negative rebate is primarily used for prepaid/top-up cards, where the first usage of coupon allows the user to buy x rebated products for later. This field may have a value in combination with Rebate. RemainingRedemptions Number of remaining redemptions Number of remaining redemptions excluding this transaction. A value of zero means that there are no remaining redemptions for this coupon (except this one). A value of ‘-1’ means that there are no limits to the number of remaining redemptions. ExtParam External parameter Optional. A list of parameter names and values that can be used by the cash register. An example would be to indicate the PLU to be inserted as a result of an redemption. ReceiptText Receipt text Optional. Parameter that the POS can choose to print on the receipt for each reservation. Giftcard Optional. Giftcard specific fields. Only supplied when Campaign.Type is Giftcard. NewBalance The current balance of the giftcard after Reserve.Codes.BalanceOffset has been applied. The actual balance offset that was applied is available in Tender.Value. MaxBalanceOffset This is the maximum value that is permitted to top-up this giftcard with (i.e. maximum Reserve.Codes.BalanceOffset). If value = 0 or parameter is not present then it is not allowed to top-up this giftcard. RejectCode Per reservation reject code Optional. A code that can be used to programatically recognize the cause of a rejection. If this field is set it means that the reservation has failed, all other values for this reservation must be disregarded. CustomerMismatch, the requested UniqueCode belongs to a campaign that is not associated with the authenticated user. CampaignInactive, the requested UniqueCode belongs to a campaign that is no longer / not yet active. CampaignOncePerSaleOnly, the campaign setup demands that the UniqueCode can only be used once per receipt and this requirement was not fulfilled. ReservationCountTooHigh, too many unvalidated+uncancelled reservations exist for this UniqueCode. ScheduleInactive, the requested UniqueCode belongs to a campaign that is no longer / not yet active. ScheduleStoreMismatch, the UniqueCode was issued for use in a specific store, this requirement was not fulfilled. ScheduleNoRemainingValidations, the campaign has a limited amount of validations and there are no validations left. CodeInactive, the requested UniqueCode has expired. CodeAlreadyUsed, the requested UniqueCode only allows one validation and is already validated. CodeNotFound, the requested UniqueCode is invalid. DailyValidationsExceeded, the code has reached or exceeded the maximum number of validations per day. Blocked, the code or campaign has been blocked. Used when phasing out a campaign, for example. RejectMessage Per reservation reject message Optional. A human readable cause of rejection message in case a rejection occurred. Only set when RejectCode is set. RejectCode Reject code Optional. A code that can be used to programatically recognize the cause of a rejection. OnescanResolveInvalidCode, the code specified for resolving a user was not usable. More details will be given in the reject message. RejectMessage Reject message Optional. A human readable cause of rejection message in case a rejection occurred. Only set when RejectCode is set. The conditions for the reservation has been met and the customer is about to be given his rebate. This call is initiated after the customer has paid, but before the transaction has been completed. The conditions for the reservation have not been met so the reservation must be released. The transaction was aborted by cashier or customer so the reservation must be released. Validations List of confirmed / approved validations. This value is the relation between reservation and validation / cancellation (see the Reserve service). RebateValue Rebate value This is the actual rebate that was given. Should be the monetary value (not percentage). If the rebate type is percentage this value will vary depending on the basket of goods to rebate. If the rebate type is units this value is the number of units given. Should not include the TenderValue. TenderValue Tender value This is the actual tender that was given. Should be the monetary value (not percentage). Should not include the RebateValue. This value is the releation between reservation and validation / cancellation (see the Reserve service). TotalValue Total value The gross total of the receipt (i.e. the total before the deduction of the above rebate/tender). OptParams Additional data Optional. A list of parameter names and values that can be set by the cash register. This field can be used to further detail the transaction. RetryCount Retry counter Initially this value is always 0. In case the POS needs to retry the request the value should be increased by 1 per attempt. Optional. A JSON representation of the whole receipt for the complete transaction, including the unique ReceiptID, EAN codes, Product price, rebate values, total sum etc. Note: The JSON code must be escaped so that the Receipt field is just a regular string. TransRef Transaction reference Optional: Unique identifier for the particular transaction on the cash register. Has the same value across the whole receipt, and is unique across all stores. The TransRef uniquely identifies one and only one receipt in all the transactions of the retailer.The TransRef should only be used in the Validate call if for some reason the final receipt ID is not available before the POS ends the transaction. In this case the POS should use a temporary TransRef for all reservations in this transaction. If you also send the receipt in this transaction, the TransRef value should be identical to the ReceiptId in the Receipt block. All OptParams items concatenated (no separator between key/value, no separator between items). ReservationId Reservation reference A reference to the submitted validation or cancellation with the same ReservationId. Receipts Receipts Information / coupons may be provided for printing on the receipt. See Receipt format. RejectCode Reject code Optional .A code that can be used to programatically recognize the cause of a rejection. If this field is set it means that the validation / cancellation has failed, all other values for this validation / cancellation must be disregarded. ReservationNotFound, the requested ReservationId was not found. Either the reserve did not complete, or the reservation has timed out. RejectMessage Reject message Optional. A human readable cause of rejection message in case an error occurred. Only set when RejectCode is set.